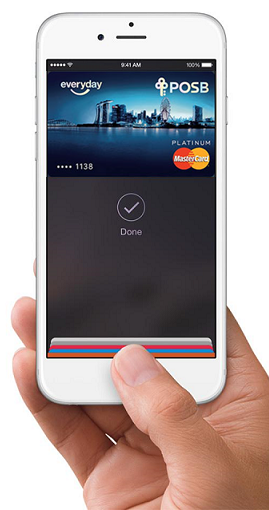 Launch Apple Pay by either double-tapping on the home button or launching the Wallet App from the home screen. An image of your Credit / Debit Card will appear. Swipe the card down to select the card you wish to pay with. Verify your card with Touch ID. Hold your phone close to the contactless payment terminal to complete the transaction. The phone icon will change into a tick once payment is made. Launch Samsung Pay by either swiping up from the home button or launching the Samsung Pay app from the home screen. If prompted, choose Credit regardless of your type of card.